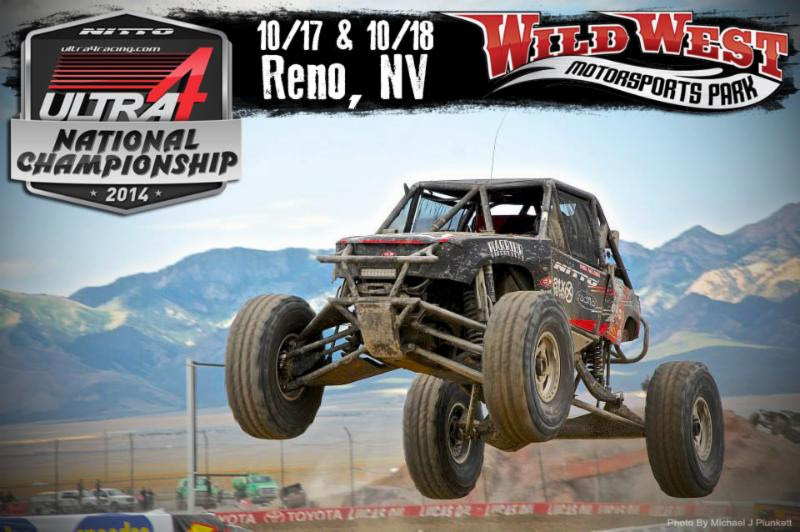 RENO, NV – AUGUST 8th, 2014: ULTRA4 Racing is pleased to announce a return to Reno, NV for the 2014 Nitto Tire National Championship the weekend of October 17th and 18th. More than 90 vehicles in five classes are committed to racing in the championship to be held at the Wild West Motorsports Park. The 2014 ULTRA4 annual awards banquet will be held at the Atlantis Casino Resort Spa immediately following the race. The Wild West Motorsports Park is located just 10 minutes from downtown Reno. The park features a course that combines technical rock obstacles with short course racing, making it an ideal venue to showcase the 4 wheel-drive capabilities of all the ULTRA4 classes. Spectators will have the opportunity to see the best racing action from the comfort of grand stands. Driver registration will take place Thursday,October 16th in the evening at Atlantis. Pre-running and qualifying will be held on Friday, October 17th at Wild West Motorsports Park, and Saturday October 18th will be a full day of racing at Wild West followed by the awards banquet starting at 8PM at the Atlantis. The Atlantis Casino Resort Spa is running an exclusive ULTRA4 promotion for spectators and teams. Those who book before August 29thcan book a Luxury room for the price of a Deluxe room at a savings of over $50 a night. Use the following link to book roomshttp://bit.ly/1krlGm1 and be sure to select Luxury rooms when prompted. Banquet ticket information will be available for drivers and teams in the coming week. Wild West Motorsports spectator tickets and on site RV reservation details will be available soon at http://wildwestmotorsportspark.com/.